Accidents happen and clean up can be frustrating. The Pee Pee Pad by Jolly Jumper helps to protect your car seat and stroller for when those little accidents do happen. Easy to tuck into the car seat or stroller and does not interfere with the safety straps. Soft quilting with non-skid waterproof backing. 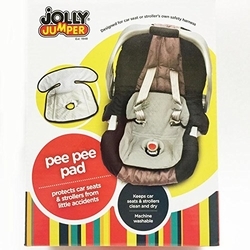 The Pee Pee Pad by Jolly Jumper helps to protect your car seat and stroller for when those little accidents do happen. Harness guard protects crotch harness from leaks or soils. Keeps car seats & strollers clean and dry.